Loquat helps the immune system, vision health and normal heart rate and fetal development and is associated with reduced risk of certain cancers. 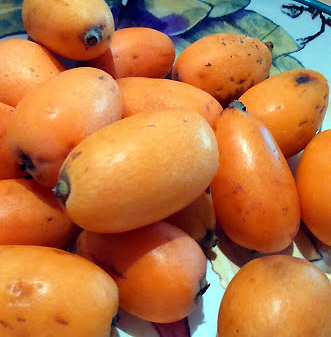 Loquat is one of the most useful and rich in vitamins A fruit. It is also well known for its high content of potassium and as a diuretic. Loquat contains carotenoids that become in the body to vitamin A, essential for normal lung, immune function, skin integrity, fetal development and normal growth, and was associated with a reduced risk of various cancers. In addition, loquat contains a good deal of potassium, an essential mineral for the body’s many functions, including normal heart rhythm, fluid balance, the transfer of nerve impulses and muscle contraction. Studies also show the beneficial effect on blood pressure control. Eight units are a medium of loquat fruit to one. 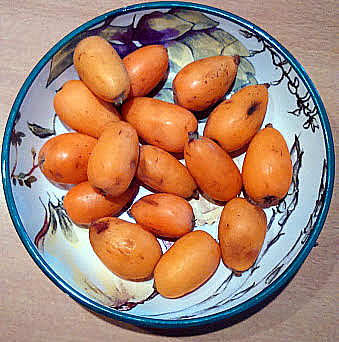 Loquat is used in cooking. In Japan and China from this fruit make wine, syrup, jams, compotes, jelly, marmalades, pastries and cakes. Decoction of the flowers loquat people drink when cough, as these has expectorant action, useful in the treatment of asthma and chronic bronchitis, as contains vitamins A, B, and C.
Loquat has long been recognized not only on the table as a dessert, but also in traditional medicine, which has long been aware of its beneficial properties and are widely applied in the treatment of the gastrointestinal tract and a number of inflammatory processes. Cooking drugs from this plant is everything immature and dried fruit, bark, leaves, pulp, and even bone. Loquat rich in acids and tannins, astringent and toning effect. This property of the fruit is widely used in the professional beauty. Many cosmetic companies manufacture creams intended for face and body, which include the extract from the fruits of Loquat . It helps to strengthen collagen fibers, whereby the skin becomes elastic. Also leaf extract of this plant is an important component of many biological complexes aimed at treatment and rehabilitation of hair and nails.